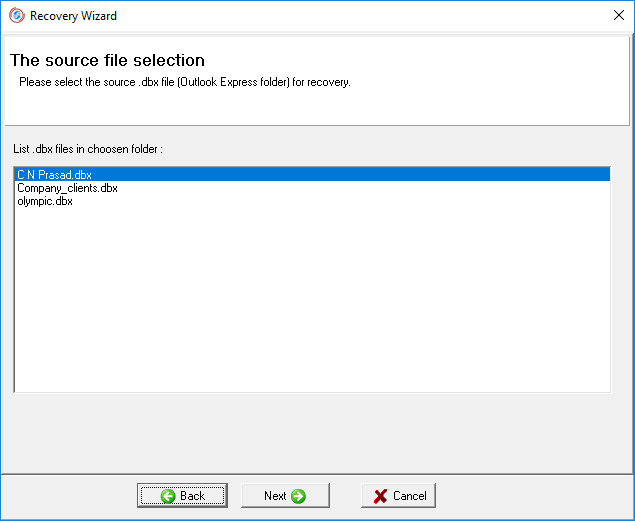 How to repair an empty Outlook Express folder with the wizard or assistant? The Recovery Wizard of the Recovery Toolbox for Outlook Express ( Download) tool is your reliable assistant in recovering messages from corrupted Outlook Express *.dbx files. It will help to organize the process of recovering correspondence from corrupted *.dbx files as clear and effectively as possible. 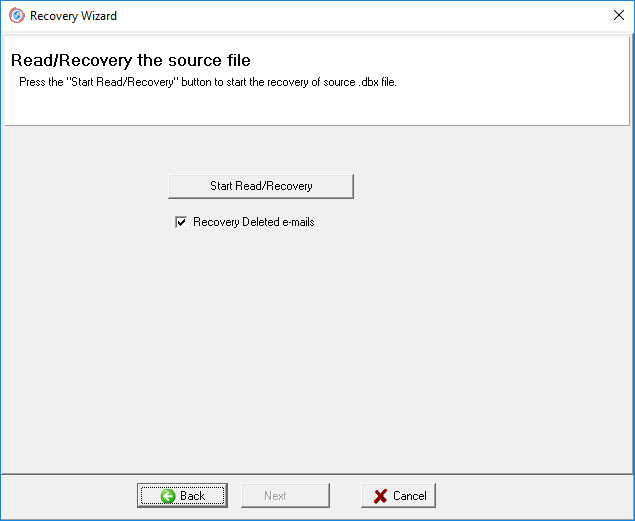 You can open the Recovery Wizard at any moment when you are working with Recovery Toolbox for Outlook Express. The process of recovering messages from corrupted *.dbx files with the Recovery Wizard consists of five steps that should be made one by one. The process of recovering messages from corrupted *.dbx files in the Recovery Wizard will not require any special knowledge or skills, just follow the instructions of the Recovery Wizard. Let us describe on each step in recovering your correspondence from corrupted dbx files with the Recovery Wizard. In this step, you should specify the path to the dbx file used by the Outlook Express mail client to store messages you want to recover. By default, the first option in the drop-down list of Recovery Toolbox for Outlook Express will be the path to the .dbx file Outlook Express uses to store the current user's messages. Other paths in the list are previously used paths to those folders on the hard drive where *.dbx files were detected. 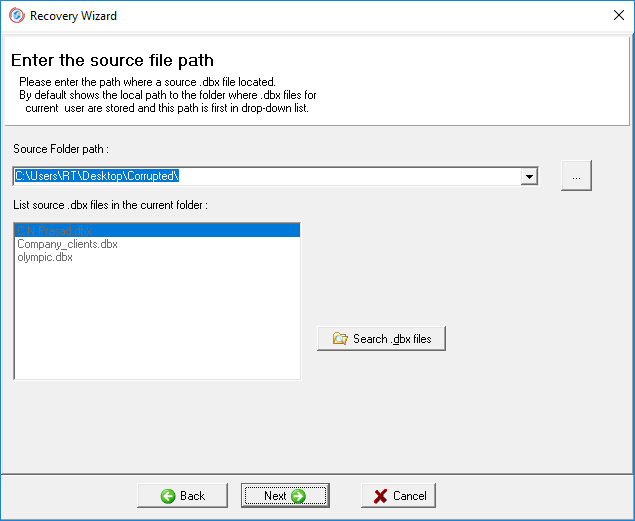 If you do not know the path to the dbx file you are interested in, use the internal dbx file search features of Recovery Toolbox for Outlook Express. The dbx file search window of Recovery Toolbox for Outlook Express is similar to that in Windows Explorer. To activate the search, click the Search .dbx files button . Select where to search in the left panel of the program (local disk, floppy disk, CD or DVD). Click the Search Now button to start searching. When the search is over, select the dbx file you are interested in in the right panel of the program and click the OK button. The path will be added to the Source Folder Path field in the Recovery Wizard of Recovery Toolbox for Outlook Express. After you specify the path to the .dbx file you want to recover, you can move on to the next recovery step by clicking the Next button. 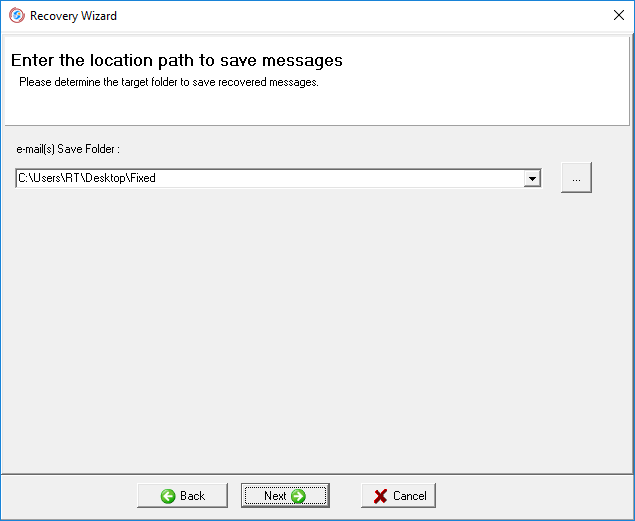 In the second recovery step, you select the .dbx file containing messages you want to recover. Specify which file Recovery Toolbox for Outlook Express should process. After that move on to the third recovery step (the Next button). Click the Start Read/Recovery button to activate the process of reading and recovering correspondence from the corrupted dbx file. If you need to recover deleted messages as well, select the Recovery Deleted E-mails checkbox (selected by default). In this case, the recovery process will take longer. The process of recovering messages from the corrupted .dbx file will take some time depending on the size of the file being processed and the performance of the computer. The reading progress bar informs you about the stage the process of recovering messages from the corrupted file is in. After the process is over, move on to the next recovery step (the Next button). Note: during the process of recovering mail from the corrupted dbx file with Recovery Toolbox for Outlook Express, no other program, including Outlook Express, must not access this file. It is recommended to close all programs that can use dbx file in their work before your start the recovery process. Note 2: Recovery Toolbox for Outlook Express does not modify information stored in the processed .dbx file in any way. By default, Recovery Toolbox for Outlook Express will offer you the last path used to save recovered messages. This path will be the first option in the drop-down menu. Other paths are also path used to save information before. The Next button will take you to the final recovery step. To create a list of messages to be saved, select the checkboxes next to each message you want to save to the disk. Choose one of the saving methods. Click the button corresponding to this option ( Save Checked, Save Current and Save All respectively) to save messages to the disk as *.eml files (RFC822 standard). Messages are saved to the disk under the names made out of message subjects, excluding special characters. Numbers in brackets  are added to file names for message with the same subjects. For example, message.eml is the first file with this name, message.eml is the second file and so on. All messages saved to the disk can be viewed in Outlook Express and, if necessary, easily copied or moved to Outlook Express folders or any other mail client supporting the *.eml message extension. 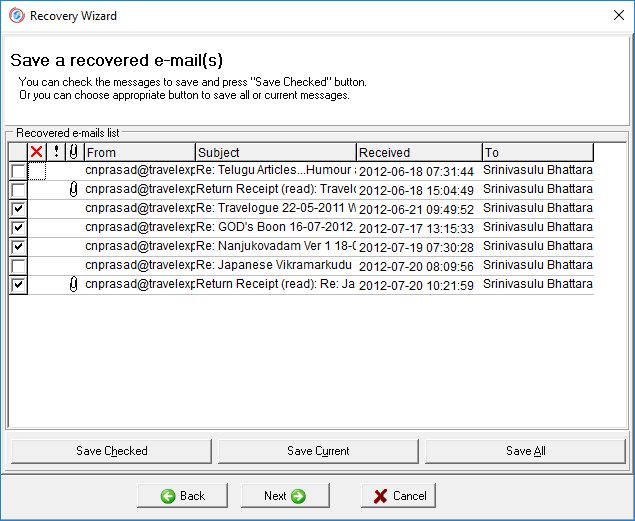 After messages are saved, Recovery Toolbox for Outlook Express will display statistics on the processed *.dbx files, the number of recovered and saved messages. The recovery of message from the corrupted *.dbx file with the Recovery Wizard of Recovery Toolbox for Outlook Express is successfully finished. Note: it is possible to save message and view their bodies only in the registered version of Recovery Toolbox for Outlook Express.